Fact: Fertilization of a human egg by a sperm leads (step by step) to a blastocyst. 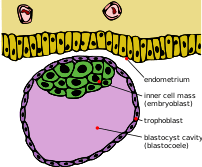 Blastocyts must attach to the uterus (implantation) for the embryo to complete it’s development and a pregnancy to be established. However, 30 % – 60 % of blastocysts do not attach (more info can be found in this post). Question: How can one utilize this fact to “save” millions of lives ? Answer: By doing research into why blastocysts do not implant, and subsequently aim for medical treatments that allow all of these blastocyst-stage embryos to develop into established pregnancies. This failure to implant is nature’s major embryo-sorting method. It is therefore not regarded neither as a disease nor as human sorting as such. The common view is that something was not right in the first place and that this malfunction lead to implant-failure. But, since non-viable or otherwise malfunctioning embryos are being sorted out, in its essence, failure to implant is just as “cruel” as embryo-sorting in vitro. Consequently, if the argument that life starts at conception holds true, then millions of lives can potentially be saved by a cure for implant-failure. Probably more than any vaccination or food-aid program . Just thought I’d mention this since it seems to have been overlooked by most anti-abortionists. Now that they know, they can turn their focus towards research and away from (sometimes harmful) politicized activism. Disclaimer: No, this is not a genuine research-proposal on my part, I am being sarcastic. I believe research aiming to improve implantation efficiency may do more harm than good (although I may be wrong on this). I am also most definitely pro-abortion (as well as responsible embryonic stem cell research, when it comes to IVF embryo-sorting based on pre-implantation genetic screening, I am less certain). My point is that the argument that life begins when the sperm enters the egg, and that all life deserves equal protection, implies moral consequences that reaches well beyond those selected by anti-abortionists. And if they want to put their money where their mouth is, they need to fix implant-failure. Maybe one day, one will not need to argue anything biological. One would only need to outlive detractors. Haha, no, just kidding, educated people don’t have children. And this is hte main reason I liuke biopinionated.com. Insightful post.